The Texas Odd Fellows are proud to announce that Brother Danny Wood, an Odd Fellow member of Fort Worth Lodge No. 251 member, was inducted as Sovereign Grand Master during the 189th Annual Session of the Sovereign Grand Lodge. Danny has been an Odd Fellow member since April 1992. He acquired his Past Grand Degree in 1996, served as District Deputy Grand Master in 1996, and organized and instituted Springtown Odd Fellow Lodge No. 75 in 2005. From 2004-2007, he was Chairman of the Grand Lodge Membership Committee. He served as Grand Marshal from 2005 to 2007, Grand Warden from 2007 to 2008, Deputy Grand Master from 2008 to 2009, and Grand Master from 2009 to 2010. Danny also served as Sovereign Grand Representative for the Grand Lodge I.O.O.F of Texas, Grand Patriarch of the Grand Encampment of Texas and was awarded the Meritorious Service Jewel from Encampment in 2012. He is also Past Captain of the Patriarch Militant of Texas and Past Sovereign Deputy Grand Master. I want to begin this report by thanking you, the members of the great state of Texas, for allowing me the privilege of serving as your Grand Master. I have so many wonderful memories from this past year and I want everyone to know just how honored I have been to serve you. Even before I was elected Grand Warden, I have been very concerned with membership growth. You may be tired of hearing it from me now, but we must continue to work hard to bring in new members. Sometimes all it takes is to ask someone to be a member and they agree. Other times, we have to be a little more persuasive and show people the benefits of membership. Each member should be knowledgeable about what our Order represents in order to be an effective spokesperson. As I've said many times before, getting the name of Odd Fellows out in the public is critical to our success. The lodges who are active in community services are the lodges who are growing. If you don't believe this, just ask the members of Polytechnic Lodge No. 248 in Ft. Worth, Thomas J. Rusk Heights Lodge No. 225 in Houston, Gonzales Lodge No. 38, Waxahachie Lodge No. 80, and Friendship Lodge No. 7 in Blue Ridge. These lodges are doing great and all are heavily involved with community service. I really think this is the key to our success. People will want to become members once they see what a positive impact a lodge can have on its community. Another important aspect of a lodge's success is social events. Lodges should schedule social activities throughout the year and invite non-members to participate. This will help educate the public about our Order and take away the misunderstanding that we are a secret society. In looking back over the past year, it would be impossible to list all of the great things that I had the opportunity to experience. My participation in the wreath laying ceremony at the Tomb of the Unknowns was definitely one of the highlights. This was a very moving ceremony and one that I will always cherish. Another highlight was traveling to Finland to visit with the Odd Fellow and Rebekah members who came to Texas last year. The comradery I enjoy with these bothers and sisters is phenomenal. I have really learned the true meaning of Odd Fellowship in my association with these outstanding individuals. I want to thank all of the lodges for the remarkable hospitality shown to me during all of my visits. At every lodge function the welcome mat was rolled out for me and I was made to feel like family. Please know that your thoughtfulness was very much appreciated and if I can ever be of assistance to you, I hope you will call on me. These are exciting times for our Order with two construction projects underway. The nursing home expansion project, which includes additional resident rooms and an administration wing, is underway and the next phase involves the renovation of the existing facility. This will greatly enhance the nursing home in order for it to continue to be the premier choice for nursing home care in Ennis. We also have a building project which includes the renovation of the large white building at the Children's Home property in Corsicana and the construction of a new large meeting facility. This project will benefit our Order by providing much needed administration space and a place to hold our annual sessions. It will also benefit the City of Corsicana and the surrounding areas in providing a place for family and community events. And most importantly, this project has the whole City of Corsicana talking about the Odd Fellows! I applaud everyone who voted in favor of these two projects and I also want to thank the members who have been giving of their personal time by serving on the committees assigned to carry them out. I believe our forefathers would be proud that we are actively planning for our future and carrying forward what they started many years ago. Before I close, I want to pay honor to my grandfather, Past Grand Master Joe Hatcher. Gramps was a big influence in my becoming a member. I also want to honor my friend, Brother Ray Kellison, who has played a key role in my membership and in my becoming Grand Master. Thank you Ray for your support and encouragement over the years. To all the members of Polytechnic Lodge No. 148 - I thank you for everything you have done for me. Your friendship and support mean the world to me. It has been a pleasure to work with the other Grand Lodge Executive Officers - James Teel, Deputy Grand Master; Clifton Cates, Grand Warden; James Curtis, Grand Secretary; Frank Ford, Grand Treasurer; and Jack Griffith, Junior Past Grand Master. These men have been a tremendous help to me during the year and I thank each of them for their friendship and their dedicated service. 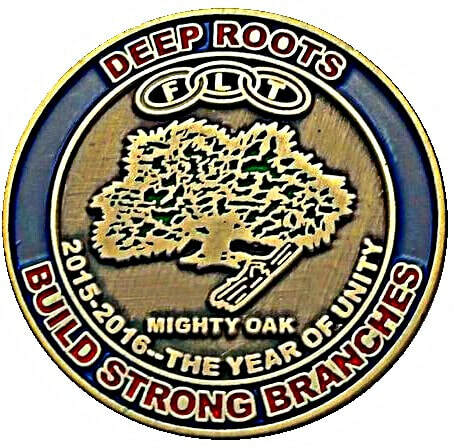 I pledge my support to incoming Grand Master James Teel and wish the best for him. To Sister Mae Nell Rhymes, I thank you for the wonderful year we have had together. The Rebekahs of Texas have a real jewel in you! This report wouldn't be complete without me acknowledging my wife, Lana. Thank you so much for your love and understanding of my time traveling as a Grand Lodge Officer. I hope you know just how much you are loved and appreciated. I have to say that I regret this year coming to an end because I wasn't able to accomplish everything that T. had hoped to do. in a couple of months I will be honored with the title of “Past" Grand Master. However, this will in no way signal an end to my work. I plan to continue working for our Order in every way possible to promote the principles of Friendship, Love and Truth. The theme of the 2016 Rose Parade was Find Your Adventure. Our 2016 float was titled The Tree of Life's Adventures and paid homage to the adventures, memorable events and achievements of families and family life. On January 1, 2016 the Odd Fellows Rebekahs Tournament of Roses Parade float completed its 5.5 mile journey along Colorado Blvd in Pasadena California. Among the riders this year were Danny Wood, Sovereign Grand Master of the IOOF, Dave Rosenberg, Grand Master of the jurisdiction of California, and Lady Cathy Doub, president of the IALAPM.